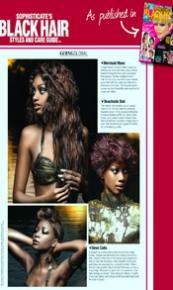 Sophisticated Black hair has graced us with a double page spread of Hector Obeng's holiday inspired beach hair . Our H-Elite hair extensions were used in all the hair extensions. The hair was coloured using redken and revlon amonnia free colours. Argan oil, cargan oil infused conditionning spray and gloss were the Hector's styling coditioning hair products used.